Grandmaster Mantak Chia was born in Thailand to Chinese parents in 1944. While still a grammar school student he learned traditional Thai boxing. He was then taught Tai Chi Chuan by Master Lu, who soon introduced him to Aikido, Yoga and broader levels of Tai Chi. It was Master Yi Eng who authorized Master Chia to teach and heal. Master Cheng Yao-Lun’s system combined Thai boxing and Kung Fu. Mantak Chia also studied at this time with Master Pan Yu whose system combined Taoist, Buddhist and Zen teachings. Master Pan Yu also taught him about the exchange of Yin and Yang power between men and women and how to develop the Steel Body. To understand the mechanisms behind healing energy better, Master Chia studied Western anatomy and medical science for two years. 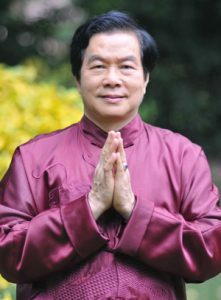 Using his knowledge of Taoism combined with the other disciplines, Master Mantak Chia developed and began teaching the Universal Healing Tao System. He eventually trained other instructors to communicate this knowledge and he established the Natural Healing Center in Thailand.